Designed for high performance street 340-360 c.i.d. Chrysler V8s. Can be used on 318 c.i.d. if 340-360 c.i.d. cylinder heads are used. Not for heavy vehicles. Will not fit 1992 and later Magnum engines. 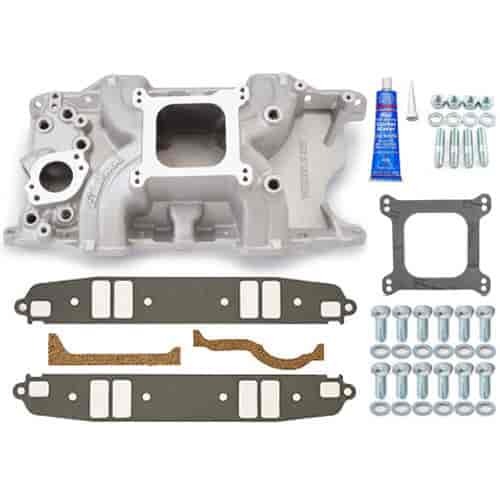 Port Exit Dimensions: 1.00" x 2.17"
Manifold Height: (A) 5.25", (B) 6.19"
The Edelbrock Torker/Torker-II manifold is a single-plane, low-rise design that works well for high-RPM, high-performance street applications. These Chrysler/Mopar application manifolds are ideal for vehicles where hood clearance is limited and are not mileage or emissions related manifolds, they are designed for high-performance!